Picking your wedding favours doesn’t need to be too hard – not when you take a look at our ideas! When trying to organise a wedding, there are so many minute little details to remember – including wedding favours. In the age of Instagram, it’s become more and more important to choose favours that are unique and look beautiful in photographs. Needless to say, it can be hard to decide on some. If you start doing some research now though, you’ll be inspired to deck your tables with gifts that your guests will be able to cherish after your big day. Make it personal with gorgeous fabric envelopes filled with individual treats for each guest. If you have the time and resources, take the time to fill each envelope with things that each guest will love. Perhaps you’ll include a favourite sweet of theirs, or knick-knacks and postcards from a place that holds special memories. Hand writing a letter to include in each one will really add a heartfelt touch. 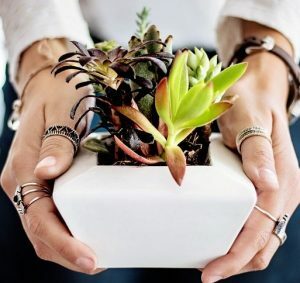 Succulents are a great wedding favour for a few reasons. Firstly, you can get them in an almost endless variety of shapes and colours, so you can be sure that each guest will be getting a unique gift. Secondly, they hardly need watering, making them a doddle to care for in the lead up to the big day. Thirdly, they’re a much more cost effective option than freshly cut flowers. If you have some green fingered guests in attendance, then why not have some seed packets on your tables? Your guests will be able to plant them in their own gardens, and every time they bloom they will be reminded of your big day. To really tie your favours in with your theme, you could include seeds that will grow into the flowers used for your bouquets and table arrangements. 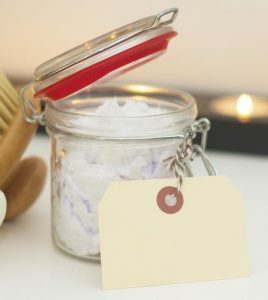 Soaps and bath bombs make wonderful favours, and there’s an option to suit everyone. You can shop for a mixture of bath time treats at a store like Lush if you are short of time. If you want to make your favours a little more personal, you can always order some personalised soaps presented in gift boxes. Candles are a really popular wedding favour option, and it’s not hard to see why. There are so many options to choose from, from gift bags filled with scented tea lights to larger candles personalised with your guests’ names or details of your wedding. Maybe you’ll pair each candle favour with a personalised box of matches for an extra special touch. A mug or teacup is the perfect gift for each guest. After all, who doesn’t like a warming cup of coffee or tea? Vintage teacups will look gorgeous on your tables, particularly if you are already going for that kind of look at your wedding. Personalised mugs are a great option too, and you can order them in bulk to cut costs. Pop a teabag into each one so that your guests can make themselves a hangover-busting cuppa the morning after the evening’s festivities. Weddings are the perfect time to reminisce with your nearest and dearest. So why not add to the nostalgia with bags of old-fashioned sweets. Include all your favourite pick n’ mix classics for maximum smiles from your guests. Flying saucers, cola bottles, chocolate mice and of course, love hearts are guaranteed to go down a treat. Some bubbly always goes down well at a wedding, so why not give your guests something extra to toast with? 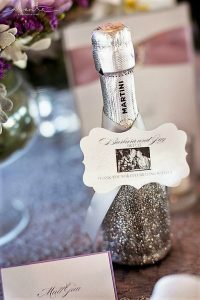 Mini bottles of champagne have fast become a really popular wedding favour, and you can source them from most reputable wine traders. To personalise them, tie ribbons adorned with gift tags around the necks and voila! If you want to give your guests really quirky favours but don’t have a lot of time to put something together, then this is the option for you. It’s important to remember your younger wedding guests throughout the proceedings, and that goes for favours too. Kid friendly favours will not only impress your little guests and make them feel important, but they will be kept amused by them throughout the evening too. So you’ll be saving some parents a headache! Mini activity books and colouring pencils, small toys like yo-yo’s and quiz cards will all go down a treat. Foodie wedding favours are an emerging trend that we’re loving. Even better, they’re really easy to put together. You can fill mini glass bottles with olive oil and a sprig of rosemary, put personalised labels on jars of spices, or buy some miniature jars of jam. These kinds of favours are really great because as well as beautiful, they’re practical. Fortune cookies won’t break the bank, and they’ll make your guests smile. Everyone loves to find out what the message in theirs says, and then they’ll want to see their neighbour’s one too. This makes them not only a sweet gift for your guests, but a great icebreaker too. Present your fortune cookies in a small gift box for maximum impact. Last but not least are wedding tea towels. 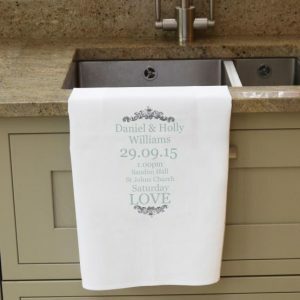 No longer just reserved for royal weddings, lots of couples are gifting their guests with a tea towel inspired by their big day. There are lots of designers out there who will create the perfect image for your towel – including this gorgeous silhouette design. Yes, they’re a little silly and sentimental – but they’ll raise a smile for years to come every time one of your guests washes up! So there you have it, a favour idea to suit everyone. 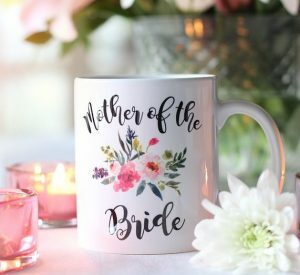 As one of the leading wedding venues in Essex, we’ve seen plenty of gorgeous and unique favours. 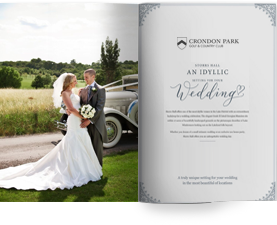 If you have any questions about how to bring your vision to life on your big day with us, don’t be afraid to have a chat! We want your wedding to be the happiest day of your life, and that means making it special down to the littlest detail. That includes your favours. Whether you use one of our ideas or take inspiration from elsewhere, we hope that it’s part of your wedding you’re now feeling confident about pulling off.